2017-10-05 00:48:10 246 19 72 3 Come say hi to me! 2017-10-06 00:45:37 219 15 51 1 Have you ever painted anything? 2017-10-07 00:43:26 271 13 40 0 Cabin or no Cabin? 2017-10-07 06:01:23 23 5 0 0 Cabin or no Cabin? 2017-10-15 00:52:37 192 18 28 4 Happy Little Landscape - Acrylics! 2017-10-17 00:45:45 239 18 56 6 Acrylic Painting-Lake in the Valley! 2017-10-19 00:45:28 259 16 43 2 Paint Along Wednesday, Acrylics! 2017-10-20 00:47:07 247 18 136 6 Symmetra Overwatch - Acrylics! 2017-10-21 00:45:58 219 19 83 17 Symmetra, Overwatch - Acrylics! 2017-10-22 00:45:23 239 22 103 2 Symmetra, Overwatch - Acrylics! 2017-10-23 00:45:31 209 16 50 4 Mountains, Happy Trees, a Cabin and a Lake - Oil! 2017-10-25 00:46:05 268 16 79 2 Happy Trees, Mountains and a Lake - Acrylics! 2017-10-26 00:45:26 229 23 89 6 Paint along day!~~ Meadow Stream - Bob Ross~~Acrylic or Oil. 2017-10-27 00:45:14 259 20 87 3 Landscape Palette Knife Painting - Oil! 2017-10-28 00:45:14 229 15 46 3 Halloween Haunted House - Acrylics! 2017-10-30 00:45:14 239 19 69 5 Ballerina Ball Gown Over A Bed Of Flowers - Acrylics! 2017-10-31 00:48:10 216 22 37 3 Aspen Trees - Oil Painting! 2017-11-01 00:45:34 249 19 65 15 Let's Paint Some Happy Mountains And An Alpine House - Acrylics! 2017-11-02 00:45:13 249 22 80 5 Starry Night - Van Gogh! Paint Along Wednesday - Acrylics! 2017-11-03 00:45:15 249 19 85 0 Starry Night - Van Gogh! - Acrylics! 2017-11-04 00:45:17 219 11 22 2 Let's Paint A Magical Winter Scene With Happy Trees And A Cabin - Oil! 2017-11-05 00:45:17 189 15 38 3 Acrylic Painting - Lilacs By The Ocean. Schau doch mal rein. 2017-11-09 01:32:12 272 17 99 1 Painting Live from the "House of Blues" - Art Show! 2017-11-12 01:45:22 199 16 30 4 Landscape Painting - Oil or Acrylics! 2017-11-13 01:45:08 219 29 62 8 Painting Lady in Red Dress - Acrylics! 2017-11-14 01:45:29 239 26 116 8 Landscape Painting - Acrylics or Oil! 2017-11-15 01:45:20 229 139 675 39 Painting A Paradise Waterfall - Acrylics! 2017-11-17 01:45:48 239 27 87 5 Painting A Woman Lost In Dance - Acrylic or Oil! 2017-11-18 01:45:51 229 20 75 10 Painting With Acrylics! Come In And Say Hi! 2017-11-19 01:45:29 239 29 80 5 Painting With Acrylics! Come In And Say Hi! 2017-11-21 01:45:18 229 24 77 5 Painting A Beautiful Winter Scene At Sunset - Acrylics! 2017-11-23 01:45:18 199 21 47 2 Happy Thanksgiving Pumpkin Painting with Acrylics! 2017-11-25 01:45:35 239 24 136 13 Gandalf At Bag End, Lord Of The Rings - Acrylics! 2017-11-26 01:45:25 209 12 107 4 Gandalf At Bag End, Lord Of The Rings - Acrylics! 2017-11-26 20:19:57 165 15 49 1 Golden Rays Of Sunshine - Acrylics! 2017-11-28 01:45:19 239 26 140 13 Painting Star Wars Death Star under Construction over Endor - Oil! 2017-11-29 01:44:53 250 29 64 8 Lord of the Rings, Mt. Doom - Oil! 2017-11-30 01:45:25 239 33 100 7 Paint Along Wednesday easy Winter Scene - Acrylics! 2017-12-01 01:45:39 249 20 72 1 The Scream - Acrylics! 2017-12-03 01:45:29 229 24 74 6 "The Scream" - Acrylics! 2017-12-03 19:45:19 199 18 58 2 Son of Man - Acrylics! 2017-12-05 01:45:11 229 19 51 8 Woman With Flaming Orange Hair - Acrylics! 2017-12-08 01:45:16 229 137 1047 177 Zelda / Hyrule Castle - Acrylics! 2017-12-09 01:45:14 249 151 1788 328 Zelda / Hyrule Castle - Acrylics! 2017-12-09 08:09:59 185 51 329 58 Time for a late night game! 2017-12-10 01:46:10 278 77 431 49 Landscape in Bob Ross's Style - Acrylics. Come watch or paint along! 2017-12-10 19:45:22 229 66 375 25 Let's play a few hearthstone games~! 2017-12-12 01:45:36 269 72 525 45 Rick & Morty - Acrylic Painting! 2017-12-12 08:20:08 114 28 46 0 Let's play Hearthstone !! 2017-12-13 01:45:16 239 51 381 23 Rick & Morty - Acrylics! 2017-12-15 01:45:13 59 41 36 6 Landscape Painting - Oil! 2017-12-15 03:20:35 44 32 0 2 Landscape Painting - Oil! 2017-12-15 04:49:57 55 32 58 3 Landscape Painting - Oil! 2017-12-16 01:45:39 239 40 198 5 Landscape - Oil! 2017-12-17 01:45:10 219 39 438 29 My Make Up Session followed by Acrylic Painting! 2017-12-17 19:47:10 207 45 239 27 Painting With Acrylics! 2017-12-18 03:34:48 210 33 224 27 Painting With Acrylics! 2017-12-20 01:46:39 268 62 483 72 Steven Universe - Acrylics! 2017-12-21 01:45:22 229 48 216 20 Paint Along Wednesday Clouds and Things - Acrylics! 2017-12-22 01:45:46 239 54 218 16 The Hobbit - Smaug - Acrylics! 2017-12-23 01:45:28 229 49 262 36 Holiday Giveaway Painting! 2017-12-24 01:45:19 229 116 516 49 Smaug - Lord Of The Rings - Acrylics! 2017-12-24 20:20:05 194 38 152 16 Just hanging, draw/paint Rita! Merry Christmas and Happy Holidays. 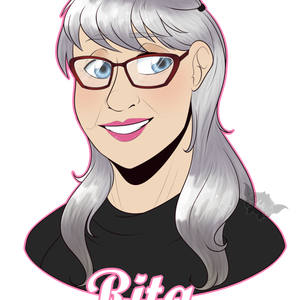 2017-12-25 02:28:34 216 44 328 40 Just hanging, draw/paint Rita! Merry Christmas and Happy Holidays. 2017-12-26 01:45:14 249 49 274 20 Arabian Horse Painting Tonight . Happy Holidays! 2017-12-27 01:45:30 359 47 347 22 Let's play some late night games! 2017-12-28 01:46:20 238 47 188 12 Paint along Wednesday! - Acrylics! 2017-12-29 01:45:46 229 43 223 10 Okami - Acrylics! 2017-12-30 01:44:53 230 34 213 3 Painting w/Acrylics & Folding Laundry with Rita! 2018-01-01 01:45:17 339 43 260 13 Final Fantasy VII Cloud vs Sephiroth - Acrylics! 2018-01-02 01:45:06 209 39 157 7 Super Mario Brothers - Let's Play! 2018-01-03 01:45:16 279 26 185 1 Let's play Hearthstone! 2018-01-04 01:45:31 239 30 131 3 Paint along Wednesday - Basque Landscape! 2018-01-05 01:45:39 289 27 167 5 Basque Landscape - Oil! 2018-01-06 01:45:12 229 28 119 1 Landscape - Oil! 2018-01-07 01:45:19 239 40 215 7 "Spirited Away" - Acrylics! 2018-01-07 19:45:48 189 26 163 4 "Spirited Away" - Acrylics! 2018-01-09 01:45:16 229 43 153 4 Landscape - Oil! 2018-01-10 01:45:09 229 33 105 8 "Tropical Seascape" paint along w/Bob Ross - Acrylics! 2018-01-11 01:45:21 219 33 121 0 Game Of Thrones - Paint Along Wednesday! Acrylics! 2018-01-12 01:45:05 219 42 194 3 Game Of Thrones - Acrylics! 2018-01-14 01:45:14 229 34 120 9 Mountain At Sunset - Painting Along w/Bob - Acrylics! 2018-01-14 19:45:52 199 27 100 0 Golden Rays Of Sunlight - Acrylics! 2018-01-15 05:37:15 167 20 71 4 Let's play Super Mario Brothers! 2018-01-17 01:45:50 229 26 74 -1 Aescher Hotel Switzerland - Acrylics! 2018-01-18 01:45:46 229 25 108 3 Paint Along Wednesday Big Blue Wave - Acrylics! 2018-01-19 01:45:21 239 21 104 1 Aescher Hotel Switzerland - Oil/Acrylics! 2018-01-20 01:45:06 229 22 87 2 Rocky Mountain Village from "Steel Ball Run, Part 7 of JJBA - Acrylics! 2018-01-21 01:45:45 239 23 114 9 Rocky Mountain Village from "Steel Ball Run, Part 7 of JJBA - Acrylics! 2018-01-21 19:45:51 229 22 102 1 Going To Finish Rocky Mountain Village from "Steel Ball Run, Part 7 of JJBA - Acrylics! 2018-01-23 01:45:31 229 37 167 16 Pokemon Ho-Oh - Acrylics! 2018-01-24 01:45:11 229 27 148 0 Pokemon Ho-Oh - Acrylics! 2018-01-25 01:45:24 239 79 694 152 Going to Finish Pokemon Ho-Oh Tonight - Acrylics! 2018-01-26 01:46:01 218 53 339 58 The Last Bastion - Overwatch! Acrylics. 2018-01-27 03:11:00 214 31 255 31 The Last Bastion - Overwatch! Acrylics. 2018-01-28 19:44:46 210 70 336 61 75% Chance Of Cabin - Acrylics. 2018-01-30 01:45:22 269 1035 1496 126 D.Va Overwatch - Acrylic! 2018-01-31 01:45:15 249 42 637 12 D.Va Overwatch & Bob Ross Style Landscape - Acrylic! 2018-02-01 01:45:20 199 104 798 163 It's Paint-Along Wednesday, Come join and have some fun! Easy Landscape-Acrylic! 2018-02-02 01:44:52 240 69 462 73 Golden Rays Of Sunshine & Bob Ross's Famous Campfire-Acrylics! 2018-02-03 01:45:48 319 72 666 112 Landscape In The Spring - Acrylics! 2018-02-04 01:45:12 219 47 235 17 Landscape In The Spring - followed by Super Mario Acrylics! 2018-02-04 19:44:08 220 41 256 17 Super Mario - Acrylics! 2018-02-06 01:56:19 218 69 248 38 Super Mario followed by Suicune - Acrylics! 2018-02-07 01:45:08 229 67 365 54 Super Mario followed by Suicune - Acrylics! 2018-02-08 01:45:41 229 51 232 14 Finishing Touches on Suicune, and Paint-Along-Wednesday- Come in and have some fun - Acrylics! 2018-02-09 01:45:26 229 40 170 6 Oil Painting w/Rita watching Bob, Western Expanse - S6E11 - Oil! 2018-02-11 19:42:24 222 30 185 4 Landscape - Acrylics! 2018-02-13 01:45:53 229 55 251 8 Witcher 3 screenshot - Acrylics! 2018-02-14 01:46:32 248 29 157 4 Witcher 3 screenshot - Acrylics! 2018-02-15 01:45:40 249 47 150 11 Paint-Along-Wednesday - Sunset by the Ocean - Acrylics! Happy Valentines Day! 2018-02-16 01:45:17 219 33 173 7 Bob Ross Style Mountains, Happy Trees, Waterfall - Acrylics! 2018-02-20 01:47:17 237 39 224 31 Lenneth, Valkyrie Profile - Acrylics! 2018-02-21 01:45:05 229 43 203 9 Lenneth, Valkyrie Profile - Acrylics! 2018-02-22 01:45:45 239 49 242 10 It's Paint-Along Wednesday, Guys! We are doing WATERCOLORS!! Join Us! 2018-02-23 01:45:22 219 28 113 1 My 2nd Day With Watercolors because the 1st Day was SO much FUN! 2018-02-24 01:45:28 229 30 142 16 Painting La Muerte from "The Book of Life" - Acrylics! 2018-02-25 01:31:17 113 30 74 -1 Wine and Paint Stream for a Fundraiser @5:30 today - Acrylics! 2018-02-25 19:44:42 200 31 113 3 Happy Sunday Everyone, Let's Paint Some Happy Trees - Acrylics! 2018-02-27 01:44:47 230 50 172 6 Painting With Rita Painting With Bob - Mountain by the Sea! 2018-02-28 01:45:14 239 33 132 -5 Super Bowl: Fruit Edition - Painting with Acrylics! 2018-03-03 01:45:10 219 31 101 10 I'll be painting Coco - Pepita tonight! 2018-03-04 01:44:52 230 18 79 0 I'll be painting Coco - Pepita tonight! 2018-03-04 19:44:17 180 33 144 10 Lazy Sunday Landscape Painting - Mountains, Happy Trees & A Lake! 2018-03-06 01:44:51 230 34 127 4 Landscape Painting - Acrylics! 2018-03-07 01:46:55 218 30 99 3 Angels & Things - Traditional Painting Oil/Acrylics! 2018-03-09 01:46:08 238 29 110 4 Vincent Van Gogh's Famous "Sunflowers" - Acrylics! 2018-03-10 01:44:22 220 24 79 -4 Vincent Van Gogh's Famous "Sunflowers" - Acrylics! 2018-03-11 18:43:49 171 33 97 0 Dance Me To The End Of Love - Acrylics! 2018-03-13 00:45:19 229 32 104 2 There is a Cabin in the Woods - Acrylics! 2018-03-14 00:45:18 219 28 98 2 Couldn't decide, but it's going to be great! - Acrylics! 2018-03-16 00:50:26 224 23 94 0 Something Colorful - Acrylics! 2018-03-19 23:15:41 249 35 181 8 Traditional Painting in Acrylics! 2018-03-21 00:56:36 218 25 95 2 Traditional Painting in Acrylics! 2018-03-23 00:38:43 256 38 167 3 Painting Giveaway Tonight To The Winner Of The Nebula Contest! 2018-03-24 00:44:53 230 23 101 -3 Hey, I need to finish some paintings - come on in and say Hi! 2018-03-28 00:44:42 90 25 63 -1 There Is A Dragon In The House Tonight !! 2018-04-03 00:45:09 229 24 132 1 I'm No Bob Ross, But Mountains & Happy Trees Is Where I Grew Up. 2018-04-04 00:43:18 231 27 121 -1 When Was The Last Time You Went To The Beach? Also...PAINTING GIVEAWAY Today! 2018-04-05 00:44:49 230 31 89 9 California Theme tonight! Watercolor paint along! 2018-04-12 00:44:23 230 39 139 12 It's Paint-Along-Wednesday! Time to WaterColor. 2018-04-27 00:47:55 197 37 92 5 Hey, I'm Back Painting 4 a Few Hours Tonight! Missed You Guys!! 2018-05-03 00:43:12 221 37 101 3 I'm Announcing The Winner Of The Painting Contest At 9PM PST Tonight - Finishing Hanamura! 2018-05-04 00:46:42 228 26 106 1 Thursday Night Painting - Blue River! 2018-05-05 00:46:24 238 17 72 -1 It's Friday Night - A Good Time To Paint! 2018-05-18 00:44:37 190 27 76 1 Painting On A Thursday Night! 2018-07-06 00:42:56 212 31 101 1 Long Time No See - Paint! 2018-09-16 21:17:48 227 26 105 7 Traditional Oil Painting - Landscape! 2018-09-19 22:44:13 240 27 126 4 Traditional Painting with Acrylic - Landscape! 2018-09-22 00:45:33 239 47 205 10 I'll be painting the old fashioned way - paint, brush,palette knife on canvas! 2018-09-25 01:04:01 210 136 286 20 Traditional painting - working on Monet's "Water Lilies"- and maybe other landscape! 2018-10-03 01:08:06 206 23 98 -2 Traditional painting - Acrylics! 2018-10-04 02:39:37 175 27 61 3 Traditional painting - Acrylics! 2018-10-05 00:44:34 270 29 106 14 Traditional painting - Water Lilies - Acrylics! 2018-10-06 00:43:50 221 26 89 7 Traditional painting - Acrylics! 2018-10-16 00:42:24 222 22 60 -1 Traditional painting-Campfire - Hanalei Church, Hawaii-Acrylics! 2018-10-19 00:44:21 220 25 69 12 Traditional Painting - Hanalei Church, Hawaii-and other things in Acrylics! 2018-10-22 04:03:33 221 17 40 1 Live Traditional Painting - Acrylics! 2018-10-23 22:15:40 339 27 151 -2 Live Acrylic Painting - Outer Space Scene! 2018-11-13 01:43:55 231 18 80 -1 And sometimes you paint a table lamp shade:-) And some Space Art! 2018-11-14 04:29:16 155 16 42 4 Traditional Oil Painting - Soft Color Landscape! 2018-11-15 04:46:39 198 17 41 -1 Traditional Oil Painting - Soft Color Landscape! 2018-11-17 01:43:54 211 17 48 0 Space Theme Tonight - Come watch! 2018-11-30 05:24:14 190 17 54 4 Traditional Oil/Acrylic Painting - Maybe Abstract with Gold? 2018-12-02 06:16:41 98 9 8 0 Traditional Oil/Acrylic Painting - Maybe Abstract with Gold? 2018-12-04 04:41:04 193 26 72 6 Traditional Acrylic Painting - Majestic Mountain, Bob Ross Style! 2018-12-12 01:45:52 159 18 55 1 Doing Some More Work On My Abstract Painting - Acrylic! 2018-12-24 23:30:34 214 25 89 5 Painting Santorini by the Ocean - Merry Christmas! 2018-12-28 01:44:55 190 20 30 1 Painting Santorini, Greece - Merry Christmas! 2018-12-30 21:44:08 320 35 139 8 Traditional Painting - Santorini, Greece in Acrylics! 2019-01-01 23:01:31 193 12 57 0 Traditional Painting - Peonies in a Vase , Henri Matisse inspired! 2019-01-09 02:53:39 241 19 60 -1 Traditional Painting - Birds Of Paradise! 2019-01-11 01:43:42 261 25 72 3 Painting Persona 5 - Morgana - Commission! 2019-01-12 03:23:48 161 21 60 4 Painting Persona 5 - Morgana - Commission! 2019-01-13 03:06:48 248 16 38 0 Painting Persona 4 - Teddie - Commission! 2019-01-14 02:25:35 249 21 71 -1 Painting Persona 4 - Teddie - Commission! 2019-01-15 01:51:58 223 19 66 -1 Painting Persona 4 - Teddie - Commission! 2019-02-15 02:18:05 266 20 83 1 Zapdos - Pokémon, Acrylics! 2019-02-16 01:42:12 222 23 56 2 Zapdos - Pokémon, with glow in the dark, Acrylics! 2019-02-17 23:43:12 191 25 64 3 Bob Ross Inspired Cabin In The Snow, Followed by Red Roses in a Vase! Happy Lazy Sunday Afternoon. 2019-02-19 01:43:26 231 14 65 -2 Painting Monet's "Trees by the Ocean" in Acrylics! 2019-02-20 01:44:08 200 32 75 5 Painting Winter Mountain - inspired by Bob Ross The Joy of Painting S12E13! 2019-02-21 01:44:31 190 148 316 160 Painting "EEVEE - POKEMON" in Acrylics! 2019-02-22 01:45:09 259 85 232 17 Painting "EEVEE - POKEMON" in Acrylics! 2019-02-23 01:47:26 227 42 120 8 Finishing Eevee, then Dark Jolteon, Pokemon night! 2019-02-24 01:44:57 270 37 156 3 Painting Dark Jolteon, Pokemon night! 2019-02-25 01:43:48 241 137 431 86 Landscape,then "Vaporeon" with glowing blue speckles in the background! 2019-02-28 01:44:16 240 97 247 17 Pokemon Venusaur w/glow in the dark blue and green speckles! Come on over!! 2019-03-01 01:45:02 189 35 114 3 Pokemon Venusaur w/glow in the dark blue and green speckles! Come on over!! 2019-03-02 01:44:22 240 35 92 2 Let's paint Sylveon - Pokemon w/glow in the dark stars moon! Come on over!! 2019-03-03 01:47:47 257 72 231 15 Let's paint Sylveon - Pokemon w/glow in the dark stars and moon! Come on over!! 2019-03-04 01:43:58 311 100 402 41 Finishing Sylveon - followed by Derium''s commission landscape with gyarados for his giveaway! 2019-03-05 01:44:19 230 48 173 11 Shiny Eevee - Commission, come on down Pokemon lovers! 2019-03-06 01:46:16 238 43 155 8 Shiny Eevee - Commission, come on down Pokemon lovers! 2019-03-07 01:45:15 219 52 182 7 Shiny Sylveon Painting - Commission, come on down Pokemon lovers! 2019-03-08 01:42:31 232 38 92 0 Shiny Sylveon Painting - Commission, come on down Pokemon lovers! 2019-03-09 01:43:56 281 39 137 4 Painting Lapras - Commission, come on down Pokemon lovers! 2019-03-12 00:45:04 229 37 101 6 Shiny Umbreon - Commission, come on down Pokemon lovers! 2019-03-13 00:44:11 190 34 129 2 Shiny Umbreon - Commission, come on down Pokemon lovers! 2019-03-14 00:43:11 231 44 104 7 Charizard Pokemon, Commission! Come on down Pokemon lovers! 2019-03-15 00:44:55 220 35 100 2 Charizard Pokemon, Commission! Come on down Pokemon lovers! 2019-03-16 00:43:57 231 32 112 2 Adding glow in the dark to Charizard , followed by "Coraline " commission. 2019-03-19 00:44:16 230 45 142 1 Playing Pokemon Crystal for the 1st time!! Need HELP! Where are the cities? 2019-03-20 00:45:41 219 30 99 3 Playing Pokemon Crystal day 2! Need HELP! Where are the cities? 2019-03-30 00:44:44 260 22 78 -1 Pokemon Crystal - Day 8! Need Help w/Clair and the Dark Cave! 2019-04-04 01:46:32 228 37 73 0 Let's Go Eevee on Switch! Pokemon fun tonight! 2019-04-05 00:45:52 259 37 77 1 Let's Go Eevee on Switch! Pokemon fun tonight! 2019-04-06 00:44:32 230 45 89 8 Let's Go Eevee on Switch! Pokemon fun tonight! 2019-04-09 00:46:37 218 38 119 3 Let's Go Eevee on Switch! Pokemon fun tonight! 2019-04-10 00:44:33 280 30 126 9 Painting Pikachu Thunder Wave - Pokemon fun tonight! 2019-04-11 00:44:56 220 20 63 2 Painting Pikachu Thunder Wave - Pokemon fun tonight! 2019-04-13 00:44:52 300 21 102 3 Let's Go Eevee Pokemon, also finishing Pikachu painting! 2019-04-16 00:45:19 219 25 74 1 Ninetales Pokemon Painting, Come Paint Along! 2019-04-17 00:44:13 120 13 36 0 Ninetales Pokemon Painting, Come Paint Along! 2019-04-19 20:32:52 272 22 92 5 Articuno Pokemon Painting, just a short stream today. Come Paint Along!